Aalborg Municipality has made education about waste and resources fun and engaging for the city's children and young people. Aalborg Municipality is well underway with their aim to educate their younger citizens with a solid understanding of the circular economy and recycling. The waste and recycling bus educates the municipality’s students about waste, recycling and sustainability. The vision is to influence students’ behavior and approach toward waste management and to teach all children that waste is a resource that must be utilized efficiently and with respect. The teaching method varies according to the different age groups and includes physical and practical activities based on the children’s everyday life. For the youngest children, two toy bats, Frede and Frida, help them locate and tell stories about waste. For the eldest children, the focus is on gamification and learning about raw materials. The education process is being developed and adjusted as new knowledge emerges and new waste and recycling initiatives are tested. In the first two years of the project, the bus has achieved impressive results. 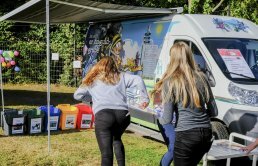 In 2017, 3,600 children were educated in sustainable waste management and another 7,500 children and adults had been in contact with the bus at various fairs and events. In the Chase of Raw Materials, elder students learn where the raw materials of their smart-phones come from and why it is worth reusing them. The course has a special focus on water and ground- water contamination. Ensuring local water quality now and in the future is therefore an integrated part of all teaching processes. The project focuses on waste and recycling, and the course both provides instruction and initiates dialogue about how children can act sustainably every day. Part of the project focuses on the problem of plastic waste in oceans. This focus is closely linked to teaching how to recycle and reuse household plastics.